The biggest challenge I had with this project was trying to make the bug man recognizable as Franz Kafka. 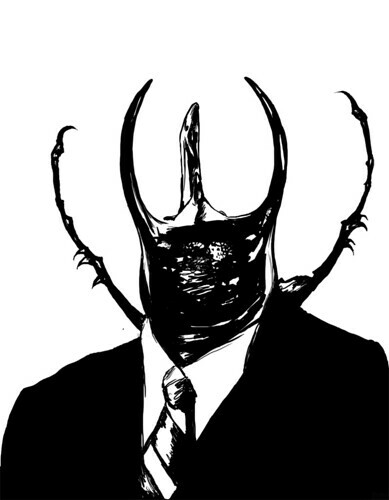 I decided to use the most famous picture of Kafka, and reproduce his body as accurately as possible to the photo. I figured that if people had seen the photo, they might draw the association more easily if my representation was fairly exact. 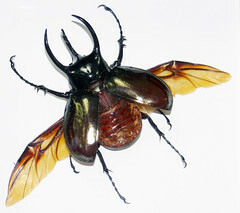 There was also the matter of choosing the beetle. While Gregor was not specifically a stag beetle, I decided to depict him as such because the stag beetle is really recognizable, and also really creepy. This linework differs from my previous drawings in that I managed to get the blacks and outlines drawn all in one step. This is partly because the image has so much black in it, but also because I was working on my new Cintiq tablet. The Cintiq helps me work much faster, so I’m producing things in much fewer steps. I added grey tones and shading beneath the black work, and the drawing was already almost finished! I put in a textured background, but this wasn’t quite enough for me to call the image finished. I decided that the posed nature of this drawing reminded me to a high school senior portrait, and that I should push this into “creepy yearbook photo” territory. 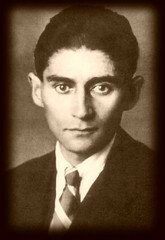 This is close, but wait… Wasn’t kafka alive in the early 1900’s? Some aging might be needed to really make this image just right. & there we have it! Gregor Samsa, class of 1915.